18 | May | 2012 | WHATEVER WAS I THINKING? I finally did it. 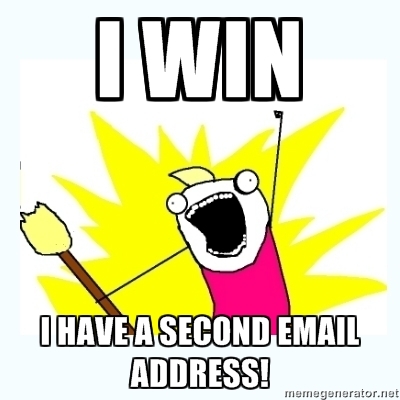 Set up that secondary email account so that all of those fabulous shopping sites I love, registrations for retail outlets, email collection requests by hapless clerks and cleaned out my main account for more meaningful content. Like, uh, when someone repins one of my posts on PInterest, and the ever pleading requests for donations from the Obama Campaign. Yes, this is a secret address and makes me feel rather clandestine, sneaky or stealthy, depending upon the level of control I wish to exert. As I work in retail, the amount of script I have to deliver to complete a sale now also contains this advice. I love it! As a matter of fact, I don’t care if they make up a totally fake one except I am sure they keep track of the “undeliverable” emails each person collects. I should mention at this point that asking for email addresses can lead to some unexpected answers. I guarantee that the average of people with an “@aol” account measures closer to 70 than 60, that the guy with the greasy hair and ripped Fleshgod Apocalypse t-shirt has an email address he should have changed when he became eligible for a driver’s license, and then the hello-kitty crowd are almost too saccharine to make you wish the death metal dude was back. Oh, the travails of the working girl. I am hoping that this gets this email fixation out of my system and I can return to the more important aspects of the interweb.